Sprinkle 1 tsp salt in a large skillet, brown the roast well on all sides over med. High heat. Remove roast to slow cooker. Add the onion to the skillet and brown lightly, stirring often. Pour in the wine: scrape up pan juices and turn into the slow cooker with the salt and pepper. Cover, turn to low and cook 10-12 hours. In a frying pan sprayed with nonstick cooking spray, brown meat. Add water, mushrooms (including liquid), and soup mix. Cover and simmer for 15 minutes. In a small bowl, blend yogurt and flour; add to meat mixture. Cook and stir on low heat until mixture thickens. Serve over hot noodles. ORIGINAL POSTERS NOTES: *NOTE: For greater flavor with little or no fat add, substitute no fat beef broth or some wine for part of the water called for in the ingredients. **If you have a sensitivity to sodium, note that the dry onion soup mix may be high in salt. I have also posted a recipe for onion seasoning mix in CAT 3 TOPic 31 that was posted on the board sometime back that enables you to use your own mix and control the amount of salt in it. Wash and coarsely shred the cabbage. Coarsely dice the bacon and the peeled onion. Saut, in a large pot, the bacon and onion. Add a little vegetable oil as necessary. 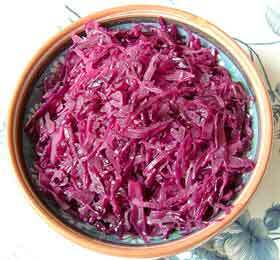 After the diced onion is light golden in color, add large handfuls of the shredded cabbage. Stir as the cabbage glazes. (careful – do not let it burn!) When all cabbage has been added and is glazed (about 1/2 volume from the starting amount of the cabbage); add raisins, bay leaves, juniper berries, cloves, wine, sugar, and enough water to cover. Peel and shred the apple, and add into pot. Simmer until tender (1-2 hours). Add salt and pepper to taste. Add additional sugar and wine to taste. Mix flour with a little cold water and add to thicken. Serve with beef dishes and potato dumplings or boiled salt potatoes. Place the meat in a bowl and set aside. Combine the vinegar, water, peppercorns, bay leaves, cloves, salt and pepper in a saucepan and heat just to boiling. Remove from heat; cool slightly. Pour mixture over meat in bowl. Cool, cover tightly and put into refrigerator. Marinate for 5 days, turning once a day. Remove meat from marinade and drain thoroughly. Strain and reserve marinade. Put pot roast in dutch oven and brown on both sides in a little butter or oil. Add 1 cup of the marinade, the carrots and onions. Bring rapidly to boiling. Reduce heat, cover tightly and simmer for about 2 hours or until tender. If necessary, add more of the marinade (don’t let the pot run dry). Remove the meat to a warm platter and tent with foil to keep warm. Stir the gingersnaps and sugar into the liquid in the dutch oven. Simmer for 10 minutes and serve with the sauerbraten. Take beefsteak (if too thick flatten cut between two layers of cellophane), salt and pepper it. Spread mustard onto beef, put bacon on mustard (lengthwise) spread mixture of parsley and onion onto beef, put stick of carrot onto all, roll the whole thing together, tie roll with thread or use toothpicks to stick through. Put oil into saucepan of medium heat, heat, put rouladen in oil and fry from all sides till brown, pour soup into pot so that the meat is about halfway covered by liquid, (don’t forget to put the lid on afterwards), let simmer for a 1 hour. Remove rouladen from sauce and keep them warm, season sauce to taste with lemon juice, red wine, mustard etc. Finally add a good measure of cream, bring to a short boil and remove from heat. Serve on a plate with a little sauce poured over, serve the rest of the sauce separately to pour over side orders. Squeeze moisture from grated potatoes. Combine in a bowl with shallots, eggs and breadcrmbs. In a heavy-based pan, melt equal amounts of butter and oil, about 1 tbsp of each at a time. Drop in spoonfuls of potato mixture, fry and flip over. Cook until golden both sides. Serve with apple sauce and sour cream. Cook the beets in boiling water until tender (about 40 minutes). Run under cold water. Peel off the skins. Chop. Set aside. Heat the butter in a lg saucepan. Cook the onion, cabbage, potato and garlic until the onion softens and the cabbage wilts (about 5 minutes). Add the beets and tomatoes. Continue to cook over moderate heat, stirring constantly, for 5 minutes. Add the stock. Add salt and pepper to taste. Bring to a boil. Reduce the heat to a simmer. Simmer for 1 hour. Puree the soup in a food processor. Return the soup to the saucepan. Bring to a boil. Remove from the heat. Whisk in the sour cream. Serve in heated bowls garnished with chopped fresh dill. Yields 6 servings. Pork Spare Ribs, slow cooked with Sauerkraut, Cabbage, Sausages, Bacon, and Potatoes, is good enough eating to serve up for Sunday dinner! And better yet, this classic meat and cabbage meal is easy to prepare, as shown by the BBQ Pit Boys! Lay steaks on a flat surface. Spread each with mustard; sprinkle with salt and pepper. Divide pickles, salt pork (or bacon), and onion among the steaks equally. Roll up steaks jelly-roll fashion; secure with beef-roll clamps, toothpicks, or thread. Heat oil in a heavy saucepan, add the steak roll, and brown well on all sides, about 15 minutes. Pour in hot beef broth, peppercorns, and bay leaf. Cover and simmer for 1 hour and 20 minutes. Remove beef rolls, discard clamps, and arrange on a preheated platter. Blend cornstarch with a sm amount of cold water, stir into gravy and bring to a boil. Boil until gravy is thick and bubbly. Correct seasonings and serve separately. Yield: 4 servings.